My first ride in an airplane was the most exciting time of my life. I grew up seeing the Alps every day, on my way to Bear School, in the Bear playground, and from my bedroom window. They are beautiful, and they are one of the few things that I miss when I am traveling about the world. Nothing could have prepared me for the sight of the Alps, seen from above, in the airplane. Words cannot describe the beauty of those snow covered mountains, stretching out below you, so I won’t even try. All I will say, is from that moment, any lingering doubts that I may have had about this adventure, were instantly gone. I was hooked, and wanted to see as much of the world as I possibly could. Before I could see the world, we first stopped in this place called Canada. After I heard my traveling companion talk about it, I went onto the Internet, and looked it up. It is a big place – a VERY big place. And it has mountains too, just like the Alps. At first I was excited about that, but then I looked closer, and realized that the place I was going was in the same country as the mountains, but it was still very far away. It was a little town called Stittsville, very near Ottawa, the capital of Canada. All through our long flight, I thought about what it would be like in this place called Stittsville. My traveling companion is a very nice man, but he is a bit older than me. I was beginning to miss talking to people my own age. As you know, I have already graduated from Bear School, but what many people forget is that we start going to Bear School when we are two years old, and we are finished by the time we are eight years old. So imagine my surprise when I arrived in Stittsville, and was introduced to a grade three class at human school. My first thought was “Grade 3 – they will be so young”. But I forgot that humans start to school later than Bears. When I met the students, I realized they were the same age as I was. At last I had someone my own age to hang around with. I had a great time, watching them play at recess, and listening to their lessons. I have learned almost as much in their school as I have in my world travels. I was just getting comfortable with my new friends, when I had the chance to go on another trip. This one was to Boston, which is in a country that I had never been to – the United States of America. 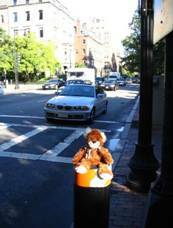 In many ways, Boston was the ideal city for my first visit to America. It is a very big city, with lots of people, cars, shops, and excitement. It has all the things that have made me always want to see America. 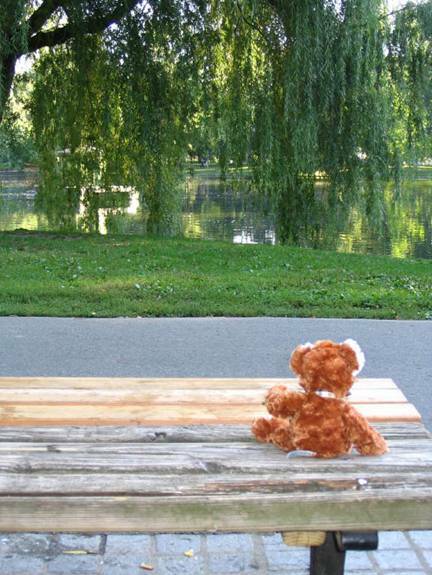 Boston also has many parks and quiet places, right in the heart of the city. It is an ideal city for a Bear who needs some time alone with nature, if he is going to be happy. In some ways, it almost has a European flavour to it, so I felt right at home there almost immediately. Every morning, bright and early, before my traveling companion was awake, I would get up, and go for a leisurely stroll through Boston Common. It has many beautiful paths that go through trees and beside small lakes. I especially enjoyed sitting on the park benches and watching the birds. A wild bear might have been tempted to catch breakfast in one of the ponds, but I am much too civilized of a bear to do that. Instead, after my morning walks, I would have a light breakfast in the hotel with my traveling companion. The reason that Boston has almost a European feel to it is that it was settled a very long time ago, by people from Europe. 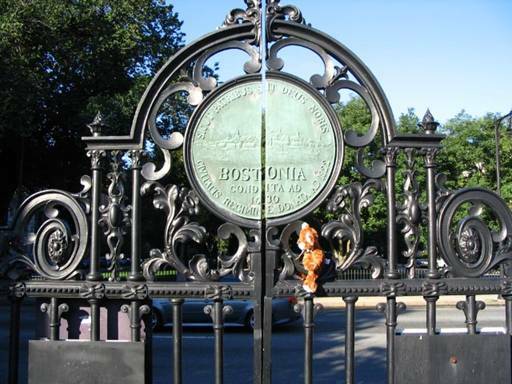 I found an interesting sign on the gates to the park, and it said that Boston had been founded in 1630. That is a very long time ago – even in people years. While I was in Boston, I also had a wonderful opportunity to see what people do all day when they are at work. 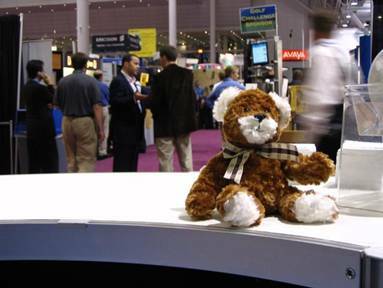 My traveling companion took me to a convention he was attending. As you know, I love watching people, so I had a great time. I had to sit very still, so that I wouldn’t frighten the people as they walked by, but I didn’t mind. Before I knew it, the trip was over, and we were headed back to Stittsville. I was very excited, because I wanted to tell my new friends in the grade 3 class all about my trip. I wonder where I’ll be going next.